Silvia Barcellos Gives a Talk at the Schaeffer Center on The Effects of Medical Expenditure Risk and Financial Strain. Silvia Barcellos is an assistant professor at RAND and has recently joined the Center for Economic and Social Research (CESR) at the University of Southern California as an Economist. 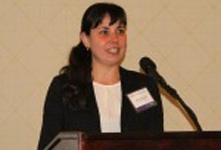 Barcellos is also a Minority Aging Health Economics Research Center (RCMAR) scholar at the Leonard D. Schaeffer Center for Health Policy and Economics. She will be presenting “The Effects of Medicare on Medical Expenditure Risk and Financial Strain” on Tuesday June 25th, 2013 at 12pm at the Schaeffer Center. Please join us for the talk. For more information please contact Jacky Mancilla at jmancill@usc.edu or 213-821-7960.